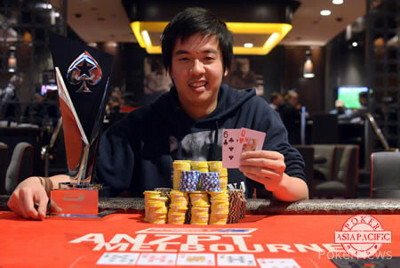 Congratulations to Edison Nguyen, Winner of the 2014 ANZPT Melbourne Main Event ($217,500)! Around 16 hours ago, 34 players made their way into the Crown Poker Room hoping to have a big day at the felt. Eyes were on the $253,000 top prize and the 2014 ANZPT Melbourne title. But as always, there can only be one winner and on this occasion it was Edison "GooGieMonA" Nguyen who outlasted all others to be crowned the champion of the largest ANZPT in history. Nguyen is widely considered one of Australia's finest poker talents, both live and online. Earlier this year Nguyen won the $2,500 Pot Limit Omaha event at the Aussie Millions and now he has added an ANZPT title and after a heads-up deal, a massive $217,500 to his resume. For Nguyen to get where he is now, 33 others had to hit the rail. The first of those, and the player to have the shortest final day at the felt, was Michael Chrisanthopoulos (34th - $4,600). From there, players like Anthony Aston (30th - $5,150), Phillip Willcocks (27th - $5,700), Henry Tran (24th - $6,250), Luke Brabin (23rd - $6,250), Luke Edwards (21st - $7,200), Anthony Legg (15th - $9,300), Joe Reina (12th - $11,400) and Roberto Damelian (11th - $11,400) all hit the rail with some cash for their time. When Michael Caruana was eliminated in 10th place, collecting $11,400 the final table was set. It was just a few minutes after the final table began that Cameron Bryce would hit the rail in ninth place, collecting $18,550. Eight-handed action would last quite a long time as the chips were somewhat shared around the table. Then, all of a sudden, four players hit the rail in quick succession. First Gabriel Messo was eliminated in eighth place. Then, there was a massive double elimination that saw Dylan Honeyman home in seventh place for $33,500 and Chua home in sixth place for $43,800. Just a short while after the double bust-out, Wayde Rickhuss found the rail in fifth place and then four-handed play didn't last long as Luke Spano quickly followed Rickhuss out the door. Spano and he was eliminated in fourth place, taking home $69,700. When only three players remained, the tempo changed completely as it would take almost four hours to reach heads-up. In the end it was Dennis Huntly who hit the rail in third place with $87,800. As soon as heads-up play began, Edison Nguyen and Corey Kempson decided to discuss a deal. Depsite having 5.4 million in chips to Nguyen’s 4.9 million, Kempson agreed to let Nguyen lock up $210,000 and leave himself with a guaranteed $195,500. These amounts meant $7,500 was left over for the eventual champion. Once the cards were back in the air following the deal, there was some strange heads-up play that made APPT President Danny McDonagh and Crown Poker TD Joel Williams pause the action. Then, just a few minutes after that hullabaloo, Kempson and Nguyen decided to go all in blind. Nguyen had Kempson covered and it was his against Kempson’s . The board ran out and it was all over as Kempson was the runner up and Nguyen had been crowned the champion! Congratulations to all the final table players, but especially to Edison Nguyen who will now go down in history as having won the largest ANZPT in history. The next event on the tour will be ANZPT Auckland which takes place from November 15-23. We must also take this opportunity to congratulate APPT President Danny McDonagh and all the team at the ANZPT, along with Crown Poker's TD Joel Williams for hosting a record-breaking event! Corey Kempson Eliminated in 2nd Place ($195,500), Edison Nguyen wins! The final hand occurred just a short while after heads-up recommenced. In the end, Corey Kempson and Edison Nguyen decided to go all in blind. Nguyen had Kempson covered and this is how the cards looked. "I'm tired, I'm done!" Kempson quipped. The dealer spread out a board and with that, Kempson was eliminated as the runner-up and Nguyen was crowned the 2014 ANZPT Melbourne champion! As per the heads-up deal, Kempson pocketed $195,000. Nguyen, our champion, collected $217,500. Some interesting events have just played out during the heads-up battle. It started with a hand that saw Edison Nguyen limp the button. Corey Kempson then raised it up to 4 million. Nguyen moved all in and Kempson folded, leaving himself with 400,000 behind. Obviously this type of play was quite suspect and APPT President Danny McDonagh and Crown Poker TD Joel Williams paused the tournament for a moment while they discussed. Eventually McDonagh questioned the players about the play and it was made somewhat apparent that some sort of deal for Nguyen to take home the trophy may have been made. McDonagh implored the two players to rethink that deal in respect to the integrity of the game. Both Nguyen and Kempson seemed to understand what was being said and so the cards started being dealt again. In a raised pot, on a flop, Corey Kempson checked to Edison Nguyen on the button. He bet 275,000 and it was back on Kempson. After a few moments, Kempson check-raised to 775,000. Back on Nguyen and he announced all in. Kempson instantly folded and the pot went to Nguyen. "How much if i sit out Edison?" Corey Kempson joked. "I don't wanna play any more!" "You just want the trophy," Kempson added. Kempson has made no secret that he is over playing poker tonight and is quite happy with his $195,500 collect. Edison Nguyen, however, is looking sharp and ready to grind. The two players have made a private deal. Despite having less chips than Corey Kempson, Edison 'GooGieMonA' Nguyen is taking more money. Here is how the prizes breakdown. There is $7,500 left over for the eventual champion! With that, the cards are back in the air. Here are the heads-up stacks. Though Edison Nguyen seemed reluctant at first, he and Corey Kempson are discussing a deal. There does happen to be a $93,000 difference between the $160,000 runner-up prize and the $253,000 top prize. After more than three hours of three-handed play we are down to heads-up! Corey Kempson folded the button and Edison Nguyen jammed from the small blind. Dennis Huntly was in the big blind with right around 1 million in chips behind. He snap-called. Huntly was looking good to double up and it stayed that way when a flop was spread on the felt. Both players had a pair, but Huntly remained in front. The turn was safe for Huntly, but the river meant it was all over in 3rd place for a $87,800 collect. It's Edison Nguyen and Corey Kempson heads-up for the title!